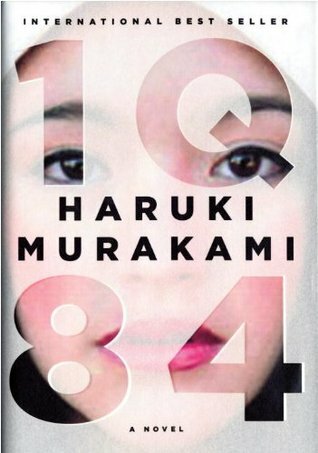 In 1Q84, the Japanese writer Haruki Murakami tells the story of a freelance assassin and an aspiring writer as they slowly become entangled with a sinister religious cult and the mysterious supernatural beings the cult worships. 1Q84 combines elements of fantasy, thriller, and detective stories with questions about the nature, function, and meaning of fiction. The English version, translated by Jay Rubin and Philip Gabriel, was published in the fall of 2011. Murakami’s novel was widely expected to be a masterwork, but the reception among English speaking reviewers was mixed, with some hailing it as a major work of literature and others seeing it as a 1,200 page novel of no great substance. I liked 1Q84 more than some of its critics, but I agree with those who think the novel is unlikely to find a permanent place among the world’s great books. As an entertainment, I thought it was successful. I was never enthralled by the novel, but I did finish reading it, and I found its main actors, Aomame the assassin, and Tengo the writer, well drawn and appealing. Only one character, however, a grotesque but finally sympathetic private detective name Ushikawa, burned with the convincing life that distinguishes great literary characters from their lesser brothers and sisters. I also didn’t think all the references to artists, discussion of metaphysical ideas, or the novels-writing-reality and reality-writing-novels tricks (which are at least as old as Andre Gide’s 1895 Paludes), added up to very much. They seemed more like the kind of fruits and nuts you might throw into a satisfying, but ultimately unremarkable cake, to make it tastier. Finally, I thought 1Q84 lacked quiddity, lacked that strange and delicate alchemy which makes a novel deeply idiosyncratic on one hand and broadly universal on the other, and which distinguishes great books from merely good ones. Fans of 1Q84 may offer two substantial objections to these opinions. The first is that I don’t know if Rubin and Gabriel’s clear and workmanlike translation of 1Q84 reflects Murakami’s work or whether English readers have lost the rhythm and music of the original prose, not to mention the subtle resonances and associations which are particular to different words in different languages, but which are essential to writers of any talent. To this I can only reply, true. That is a difficulty with any translation. The second problem is the (reasonable assumption as it turns out) that I am largely unfamiliar with Japanese culture and society. This means that if Murakami created a metaphorical history of Japan in 1Q84, or included large amounts of sociological comment, or has written significant elements of parody or satire into the novel, the chances are something better than 95% that I don’t get them. To this I can only reply, also true. But it is a quality of literature that it transcends the time and place of its composition, and speaks powerfully to readers in other places and other times. That 1Q84 falls short on this measure does not make it a bad book. But it doesn’t make it an important one, either. But you are right. Translation has something to do with it probably. I don’t know. But right now, I feel Murakami’s a lover I hated to part with, but go he must! Thanks for the comment, JAF. I came late enough to the hype for 1Q84 that I asked myself, What am I missing? As you saw, I asked myself the same question once I was done with the book. Thank you, PGM, for your kind note. I should add to my rather hasty comments appended to your very well-considered overview of 1Q84. Having finished the book yesterday, I must admit to a sense of deprivation. It was a lot of fun while it lasted. The main characters–as so often in Murakami’s writing–were very well drawn. It could even be said that they draw the reader into them, even in the case of the physically off-putting Ushikawa. In addition to characterisation, the plot is very well put together–even though Murakami has to turn round occasionally to remind the reader what is happening. Perhaps that is inevitable due to the complexity involved. I suppose my impressions of Murakami have been rather biased From using one of his favourite short stories (“Neji-maki dori to kayôbi no onna-tachi”)–yes, the tale about the “Windup Bird” in a university Japanese to English translation class for over a decade. That story, from the late 80s, is steeped in the “suburban anomie” which characterises some of Murakami’s earlier work. But it would be unfair to judge the major novels on the basis of a single short story from that era.